Kevin Echemendia, our co-founder and director of photography, will be on set for a filmmaking production throughout the month of April. When our team was discussing this, we all geeked out and were using terms like, “G&E” or “martini” and even “fly swatter.” That got us thinking that when we use these terms in our blog posts or on social media, that maybe you are unsure of what exactly we’re saying. We wanted to take this opportunity to provide insight into the filmmaking world. So, here is part one in our “What’s the Word?” blog series. During April Kevin will be working in the grip and electric department, otherwise known as G&E, as a grip. They are in charge of all electrical needs on set along with supporting all non-electrical components. 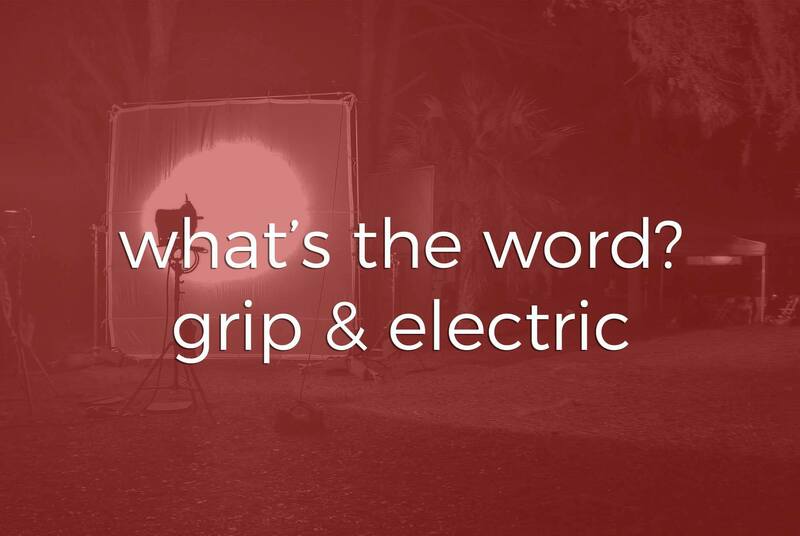 Grips are technicians who specialize in camera and lighting rigging. Their duties cover a wide variety of tasks such as camera movement, focusing lights, and rigging of gear. Earlier this year Kevin was a grip during part two of Kevin Smith’s Kilroy Was Here along with a three part Walgreens commercial shoot that took place in Sarasota. The two individuals who are responsible for the G&E department are the Gaffer and Key Grip. The Gaffer is the head of the electrical department. They are responsible for designing and executing the lighting plan of the Director of Photography to create the look for the camera. 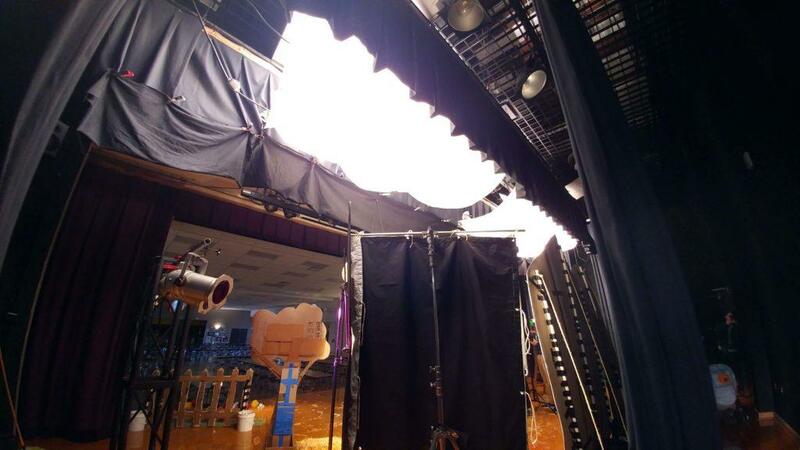 The Key Grip works to diffuse and shape the light on set. They are also in charge of the physical camera movement. This covers everything from a dolly, to cranes, to rigging the cameras and lights on set. There are also lots of fun terms that we use to refer to certain set ups, such as fly swatters and booklight. Without the G&E Department, each production would not happen. While there are plenty of people who can plan, idealize, and visualize, without the crew to physically move the stands, lights, or manipulate day for night, there would be no production resulting in a music video, commercial, or film. Grip & Electric Department (aka G&E): The department on a production set responsible for rigging, staging, moving and manipulating lights and their stands. They also oversee equipment for the camera team such as dollys and cranes. They also run all power for the entire production. 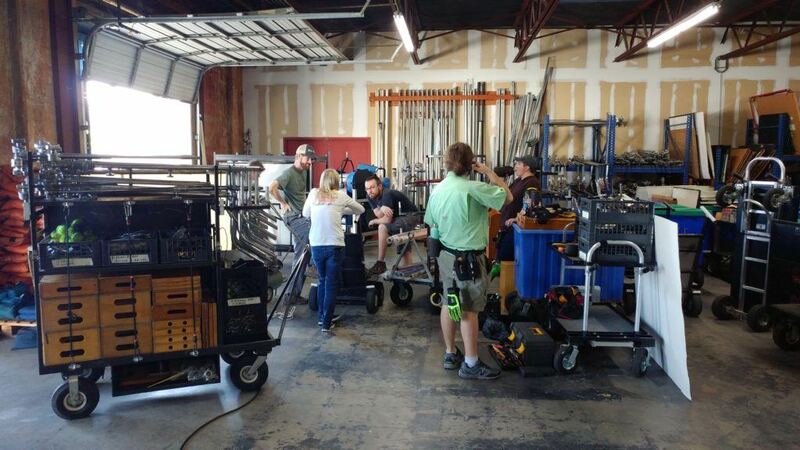 Grip: They have two main functions: first, to work with the camera department to provide camera support, such as dollys and cranes; second, they work to rig and stage lights on set. Booklight: A lighting set-up consisting of a large light facing a reflective material that then gets diffused further. This is intended to make a soft lighting source. Are there any specific terms you’re curious about? Let us know and we’ll include them in one of our upcoming blogs!